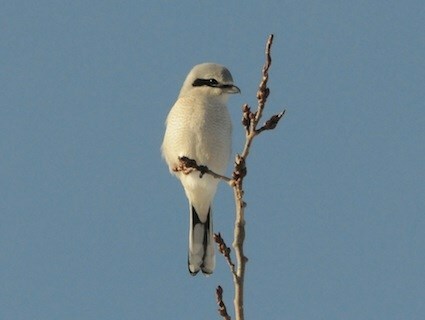 Northern shrike sighting! We drove up Blacksmith Fork Canyon this morning, looking for wildlife. We spotted about a bazillion deer, mainly up the snow-free slopes high above us. Behind the Hardware Ranch visitor center we also spotted six elk about 200' from us – the only elk we saw on the entire trip. The herd at Hardware Ranch, we read, has left to follow the snow line up higher. Presumably if it does get cold again, they'll be back (for the free hay dispensed at Hardware Ranch). We also read that the moose prefer to stay above the snow line, which may explain why we've only had one sighting so far this winter.